(3) The 'column-sway' buckling mode of an unstiffened column web in compression illustrated in Figure 6.7 should normally be prevented by constructional restraints. (4) Stiffeners or supplementary web plates may be used to increase the design resistance of a column web in transverse compression. 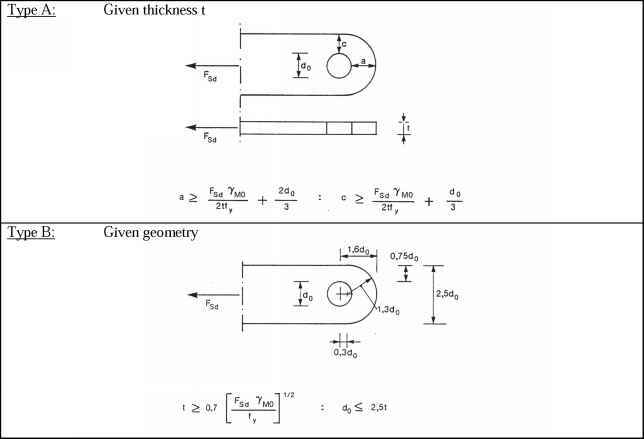 (5) Transverse stiffeners or appropriate arrangements of diagonal stiffeners may be used in association with or as an alternative to, transverse stiffeners in order to increase the design resistance of the column web in compression. NOTE: In welded joints, the transverse stiffeners should be aligned with the corresponding beam flange. In bolted joints, the stiffener in the compression zone should be aligned with the centre of compression as defined Figure 6.15. (6) Where an unstiffened column web is reinforced by adding a supplementary web plate conforming with 6.2.6.1, the effective thickness of the web may be taken as 1,5 twc if one supplementary web plate is added, or 2,0 twc if supplementary web plates are added to both sides of the web. In calculating the reduction factor co for the possible effects of shear stress, the shear area Avc of the web may be increased only to the extent permitted when determining its design shear resistance, see 6.2.6.1(6). co is a reduction factor to allow for the interaction with shear in the column web panel. ac and rc are as indicated in Figure 6.8 and ab is as indicated in Figure 6.6. (3) For a bolted connection, the effective width 6eff,t,wc of column web in tension should be taken as equal to the effective length of equivalent T-stub representing the column flange, see 6.2.6.4. (4) The reduction factor co to allow for the possible effects of shear in the column web panel should be determined from Table 6.3, using the value of ¿eft,t,wc given in 6.2.6.3(2) or 6.2.6.3(3) as appropriate. (5) Stiffeners or supplementary web plates may be used to increase the design tension resistance of a column web. (6) Transverse stiffeners and/or appropriate arrangements of diagonal stiffeners may be used to increase the design resistance of the column web in tension. NOTE: In welded joints, the transverse stiffeners should be aligned with the corresponding beam flange. In bolted joints, the stiffener in the compression zone should be aligned with the centre of compression as defined in Figure 6.15. (7) The welds connecting diagonal stiffeners to the column flange should be fill-in welds with a sealing run providing a combined throat thickness equal to the thickness of the stiffeners. (9) In calculating the reduction factor co for the possible effects of shear stress, the shear area Avc of a column web reinforced by adding supplementary web plates may be increased only to the extent permitted when determining its design shear resistance, see 6.2.6.1(6). (2) The dimensions emin and m for use in 6.2.4 should be determined from Figure 6.8. (3) The effective length of equivalent T-stub flange should be determined for the individual bolt-rows and the bolt-group in accordance with 6.2.4.2 from the values given for each bolt-row in Table 6.4. 0,8 rc m e a) Welded end-plate narrower than column flange.